If you're not certain about grammar, brush up. Far from being a boring, arcane list of do's and don'ts, grammar is a dynamic system of extraordinary beauty and power. It is the design that transforms a series of words from a meaningless list into the expression of a thought. Grammar is what makes verbal communication possible. 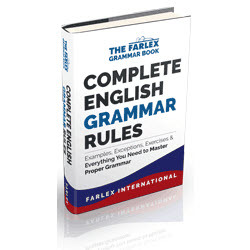 Understanding the rules of grammar and usage doesn't require you to adhere slavishly to them. But readers can tell the difference between an author who breaks the rules deliberately to achieve a purpose, and one who doesn't know or care what he's doing. For guidance, try The Elements of Style by William Strunk, Jr. and E.B. White. This slender volume, which has become a classic in the decades since it was first published, is a succinct and authoritative guide to presenting ideas with clarity and flair. You might also want to add to your reference shelf two books by Karen Elizabeth Gordon: The Deluxe Transitive Vampire and The New Well-Tempered Sentence. These peculiarly named works offer sound advice on grammar and punctuation respectively, yet demonstrate the rules with flights of fantasy so that these seemingly dry subjects become whimsical and fun.